Stem cells are promising therapeutic carriers to treat brain tumors due to their intrinsic tumor tropism. Non-invasive intranasal stem cell delivery bypasses the blood brain barrier and demonstrates strong potential for clinical translation. This article summarizes the basic principles of intranasal stem cell delivery in a mouse model of glioma. Yu, D., Li, G., Lesniak, M. S., Balyasnikova, I. V. Intranasal Delivery of Therapeutic Stem Cells to Glioblastoma in a Mouse Model. J. Vis. Exp. (124), e55845, doi:10.3791/55845 (2017). The intrinsic tropism towards brain malignancies renders stem cells as promising carriers of therapeutic agents against malignant tumors. The delivery of therapeutic stem cells via the intranasal route is a recently discovered alternative strategy, with strong potential for clinical translation, due to its non-invasive nature compared to intracranial implantation or delivery via systemic routes. The lack of blood brain barrier further strengthens the therapeutic potential of stem cells undergoing intranasal brain entry. This article summarizes the essential techniques utilized in our studies and outlines the basic principles of intranasal strategy for stem cell delivery using a mouse model of intracranial glioma xenografts. We demonstrate the optimized procedures that generate consistent and reproducible results with specific predetermined experimental parameters and offer guidelines for streamlined work flow that ensure efficient execution and reliable experimental outcome. The article is designed to serve as a baseline for further experimental customization based on hypothesis, stem cell types, or tumor specifics. Low toxicity, low immunogenicity, and intrinsic brain tumor tropism of human stem cells are attractive traits for the delivery of therapeutics vehicles1. Novel stem cell-based therapeutics for malignant brain tumors are promising innovations developed in recent years, and the intranasal adaptation of this therapeutic strategy represents a leap towards clinical translation, in that non-invasive and repeated administration might dramatically reduce the barrier for patient applications and may be adaptable for out-patient services without general anesthesia or lengthy in-patient service associated with invasive surgical procedures1,2,3,4. We and others have pioneered the intranasal route of stem cell delivery to brain tumors and have laid the ground work for some of the basic principles of translational research using mouse xenograft models2,3,4, as well as investigated the migration of stem cells in vivo via magnetic resonance imaging (MRI) reagent carriers2. Through these pilot explorations, we have accumulated substantial experience and gained insight on how to best construct a robust pre-clinical evaluation strategy using well-established patient-derived xenograft (PDX) mouse models of malignant glioma, while maintaining the investigative resolution to examine the nuanced mechanistic details of the sophisticated biological phenomena of the intranasal brain entry of therapeutic stem cells delivered to the nasal cavity. Here, we describe the principles of a standardized operating protocol to demonstrate the current state of experimental investigations using a well-established human neural stem cell line HB1.F3.CD5,6,7,8, which is readily modifiable to adapt to specific tumor models or strategies using human stem cells as therapeutic carriers. All animal procedures must be approved by the Institutional Animal Care and Use Committee (IACUC) or equivalent. If there is any uncertainty regarding the specific procedures described herein, do not proceed. Clarify with the institution's IACUC and a designated veterinary staff member. Follow the standard good laboratory practice in all cell culture procedures and IACUC requirements for cell testing and pathogen-free status confirmation prior to administering to mice9,10. Follow the NIH requirement for cell authentication to ensure reproducible outcome11. Follow established small animal surgery aseptic techniques outlined in this manuscript4. Culture glioma cells (GBM43, GBM6, and U87MG) in serum-containing (10% fetal bovine serum in Dulbecco's Modified Eagle's medium[DMEM]) or serum-free medium (Neurobasal medium with supplements B27, N2, heparin, epidermal growth factor [EGF], basic fibroblast growth factor [bFGF], antibiotics, and L-glutamine12), in a humidified CO2 cell culture incubator. Test all cell lines via the mouse clear panel run from commercial service providers. Collect adherent cells by removing culture medium. Incubate with 0.05% trypsin for 5 min at room temperature (1 mL of trypsin for T25 flask, 2 mL for T75 flask, scale accordingly for culture flasks with larger surface area) and then wash cells with Ca2+ and Mg2+ free phosphate buffered saline (PBS). Tap the flask to dislodge cells and immediately neutralize with an excess of serum-containing medium (8 - 9 mL). Then use serological pipettes to aspirate the cell suspension into centrifuge tubes. Centrifuge cell suspension at 400 x g for 5 min. Wash the cell at least twice with 10 mL of PBS by repeated centrifugation. Collect glioma cells grown as tumor spheres in serum free medium via centrifugation (same speed and duration as above); dissociate the cell pellet by incubation in 1 - 2 mL of cell detachment solution at 37 °C for 5 min before washing twice with 10 mL of PBS by centrifugation (400 x g x 5 min). Re-suspend glioma in sterile saline at a concentration of 50,000 - 200,000 cells per 2.5 µL. Cell numbers used for injection into mouse brain depend on the established growth rate for each glioma cell line. Here, use 25,000 and 100,000 for GBM43 and GBM6 patient-derived tumor cells, respectively. Prepare double the amount of the necessary cell number for implantation to account for the loss of a fraction during procedure. Transfer the injectable cell suspension to a sterile microcentrifuge tube and place tube on ice. Keep cells on ice for 2 h maximum during surgeries, prepare new batch if extended surgeries are planned. Prior to the surgery day, sterilize all surgical tools in an autoclave, and prepare all pre- and post-surgical animal care material per IACUC approved protocol. Sterilize the stereotaxic frame and peripheral equipment to ensure intraoperative aseptic conditions, thus minimizing complications. Organize the operation area to minimize clutter and possibility of contamination. Dress in appropriate personal protective equipment (PPE) per IACUC requirement. Set up appropriate post-operative recovery chamber. Ensure that anesthetics and analgesics are prepared fresh using unexpired reagents. Set up appropriate body heat maintenance instruments per IACUC approved protocol. To establish human patient-derived glioma cell xenografts for the testing of intranasal delivery of human NSCs, use immunocompromised mouse species such as nu/nu athymic mouse of any gender at approximately 6 weeks of age. Anesthetize the animal based on body weight using the approved reagents, i.e. either via an intraperitoneal (i.p.) injection of a mixture of ketamine (50-100 mg/kg; consult institutional IACUC for approved dose range) and xylazine (5-10 mg/kg; consult institutional IACUC for approved dose range) in 200-250 µL sterile saline, or via 4-5% isoflurane anesthesia using an inhalational device. Ensure the animal has reached the surgical anesthesia plane by toe pinching prior to the skin incision. Apply ample sterile ophthalmic gel to ensure the moist state of corneas of the animal. Sterilize the skull using repeated and alternating circular wipes of betadine and isopropyl alcohol per Pritchett-Corning et al.14. Supply the pre-incision analgesia by s.c. injection of Buprenex (0.05 - 2 mg/kg) prior to incision using the surgical blade. Use sterilized cotton-tipped applicator to help hemostat while exposing the skull; use 3% hydrogen peroxide to facilitate the clearance of incidental bleeding. Use a battery-powered handheld electric ballpoint drill (less than 1 mm in width) to create a burr hole at 2 mm lateral, either left or right, to the midline, and 2 mm behind the Bregma (the position coordinates can be customized based on the tumor model intended for a particular study). Mount the animal to the stereotaxic frame to the appropriate head posture, such that the inserted Hamilton micro syringe is perpendicular to the surface of the skull around the burr hole. Take care to ensure that the animal's anesthetic plane is in good standing by toe pinching. Observe the respiratory rate to make certain that the animal is not under pain stress during the following steps. Cheek support is much easier to perform and capable of achieving the same levels of mouse head stability and balance during positioning. It is an added benefit for multiple time-sensitive surgeries to ensure timely completion with good cell viability. Use the stereotaxic frame knobs to position the flat tip micro syringe to the burr hole, then lower it slowly to 3 mm below the dura surface. Retract 0.5 mm to maintain the tip of the needle at 2.5 mm below the dura. Inject 2.5 µL of preloaded glioma cells over the period of 1 min. Let the needle maintain its position for another 1-2 min before slowly, over the course of 1 min, withdrawing the needle out of the brain and taking care to minimize cell backflow. Apply sterile bone wax to avoid extracranial tumor outgrowth. Close the wound using stainless steel wound clips (7 mm). Deliver a subcutaneous (s.c.) injection of 1 mL of sterile lactated Ringer's solution (pre-warmed to 37 °C), and place the animal in a recovery chamber which is halfway on a heating pad. Return the animals to the ventilated rack once they regain mobility, and follow routine post-op care to ensure smooth recovery. NOTE: The patient-derived glioma cells are modified to express firefly luciferase. This allows us to follow tumor progression after intracranial implantation. Give animals an i.p. injection of the D-luciferin, potassium salt (150 mg/kg) 10 min prior to the imaging session. Immediately place animals in an oxygenated isoflurane induction chamber approved by the IACUC. Place animals inside the heated (37 °C) imaging chamber to capture the BLI signal using software settings (for details, see manufacturer instruction). NOTE: To enhance the migration of intranasally delivered hNSCs to brain tumors, whole brain irradiation of mice bearing intracranial tumor xenografts can be utilized 4. Use an i.p. injection of a ketamine and xylazine mixture (50-100 mg/kg and 5-10 mg/kg respectively; consult institutional IACUC for approved dose range) with sub-surgical anesthesia plane to moderately induce anesthesia for mice. 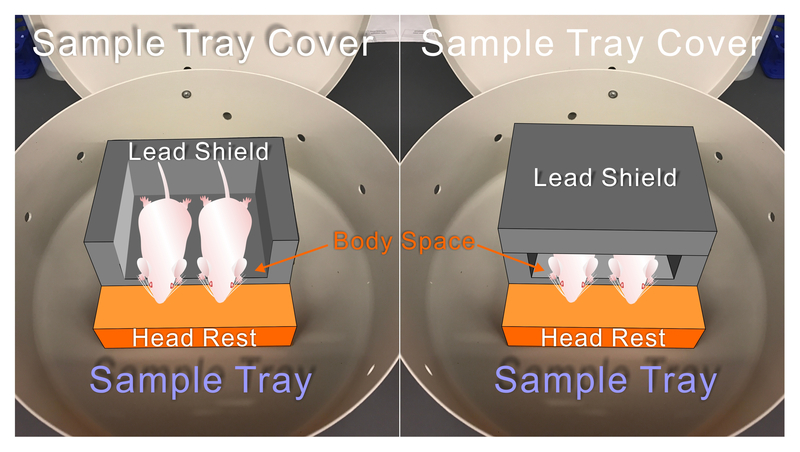 Utilize a sample tray to position the mice inside the chamber between lead shielding blocks, allowing for head-only exposure to the radiation path (Figure 2). Give mice with positive BLI confirmation of tumor growth (normally at day 7-8 after glioma cells implantation) a daily dose of 2 Gy of irradiation for 5 consecutive days. Perform BLI assessment of tumor after the last irradiation dose. Maintain human NSCs (clone HB1.F3.CD)6,7 in DMEM medium with 10% FBS and 1% penicillin-streptomycin in a humidified 37 °C incubator under 95% room air and 5% CO2 (NNSCs). Perform genetic overexpression of chemotaxic receptors, such as the C-X-C motif chemokine receptor 4 (CXCR4), in hNSCs by transduction with lentivirus encoding for human CXCR4. When NSCs are near 75-80% confluency, add the CXCR4 lentivirus to the culture medium along with polybrene (8 µg/mL), and incubate for 8 h or overnight. Replace virus-containing medium with fresh medium containing blasticidin at 4 µg/mL for positive selection of transduced cells. Validate the level of CXCR4 expression in modified hNSCs (CXCR4NSCs) via flow cytometry using anti-CXCR4 antibody and matching isotype antibody and via quantitative RT-PCR using a pair of primers amplifying CXCR4 and glyceraldehyde-3-phosphate dehydrogenase (GAPDH) cDNAs4. Generate vector control NSCs (VCNSCs) using the same strategy, with RFP replacing the CXCR4 gene, and verify via microscopy or flow cytometry due to the presence of RFP fluorescence. Plate cultured NSCs in T75 culture flasks as described above until 90% confluency is reached. Place cell culture flasks inside a humidified CO2 chamber/incubator with maintained 1% O2 levels for 24 h, via N2 gas supply controlled by an automated built-in flow meter. These cells are referred to as HNSCs. Control NNSCs are described in step 7.1. 8.1.Infect NNSCs, HNSCs, VCNSCs, and CXCR4NSCs with 50 conditional replicative adenovirus (CRAd)-S-pk7 viral particles/cell4,16. 8.2.After 2 h of incubation at room temperature with periodic tapping, wash cells three times with media to remove unbound viral particles and suspend cells in sterile saline for injection. CAUTION: Carry out all virus-related in vitro cell culture procedures in facilities with the appropriate biosafety level designation, such as BSL2. Appropriate personal protective equipment must be worn by researchers handling the oncolytic virus per institutional animal facility guidelines4,16. To label stem cells, add MPIOs to stem cell cultures at ~80% confluency, in the presence of transfection reagent for overnight incubation. The efficiency of stem cell labeling (NSCs4 or MSCs2) with MPIOs (flash red conjugated) is determined by flow cytometry. To visualize stem cell migration and distribution in the brains of glioma-bearing animals, acquire both multi-slice high resolution T2 weighted Rapid Acquisition with Relaxation Enhancement spin echo images and multi-slice T1 weighted Fast Low Angle Shot (FLASH) gradient echo sequences to evaluate the structure via both coronal and axial planes of the mouse brain2. Culture and collect NSCs (NNSCs, HNSCs, VCNSCs, and CXCR4NSCs) according the protocol described in section 3. CAUTION: All animal procedures involving OV-loaded NSCs must be carried out in facilities with the appropriate biosafety level designation, such as BL2 or BSL2 facilities. Anesthetize mice via i.p. injection of a ketamine and xylazine mixture according to step 3.6. Place mice on a clean drape facing up with a heating pad underneath to maintain body temperature. Adjust a padded pillow made of rolled up paper towels with tapes to ensure the upright angle of the nostrils when placed under the head of the mouse. NOTE: Hyaluronidase pre-treatment (total of 100 U as four repeated inoculations at 5-min intervals, 3 µL in each nostril) of the nasal epithelium was described previously2,17. Using a micropipette, dispense 2 µL of NSC suspension to each nostril of the mouse. Visually confirm the aspiration of the droplet before moving to the next mouse. The total number of cells delivered can be determined by the user; use 62,500-125,000 cells/µL, such that 0.5-1 million cells can be delivered in 4 x 2 µL doses. Use a timer to ensure 5 min intervals between each cell suspension administration, up to 4 times. Allow animals to regain mobility in a recovery chamber, with the supine position maintained throughout. Enter the survival duration data of animals in statistical software, and perform statistical comparisons using the log-rank test with the following significance designations: *p <0.05, **p <0.01, ***p <0.001. At the end point of the study, euthanize mice via the IACUC-approved protocols. A standard practice is using a flow rate-controlled CO2 chamber to sacrifice the animals as the primary euthanasia strategy followed by exsanguination by perfusion fixation. Immediately after being sacrificed, perform an intracardiac perfusion with PBS on the animal to ensure the elimination of blood residues from blood vessels and the preservation of tissues for subsequent histological analysis. Place the CO2-euthanized animal on top of an absorbent pad in the supine position, proceed with a laparotomy to expose the diaphragm muscle, which is dissected along with the rib cage, to expose the heart. After making a nick on the right atrium using a pair of dissection scissors, accelerate the exsanguination with a 3-5 mL of PBS injection via the left ventricle at the apex. Inject ice-cold 4% paraformaldehyde (PFA) into circulation using a syringe; peripheral muscle spasms provide visual confirmation that there is no major blockage in the circulation that would prevent proper tissue fixation. Surgically remove the head of the carcass and preserve in a 50 mL centrifuge tube in 4% PFA at 4 °C overnight. Change the solution to 30% sucrose the following day prior to brain tissue dissection another 24 h later. Embed the brain tissue in OCT compound and flash freeze on isopentane on dry ice. Perform cryosectioning of the resultant tissue block to generate 10-20 µm tissue sections for histology and immunocytochemistry applications. 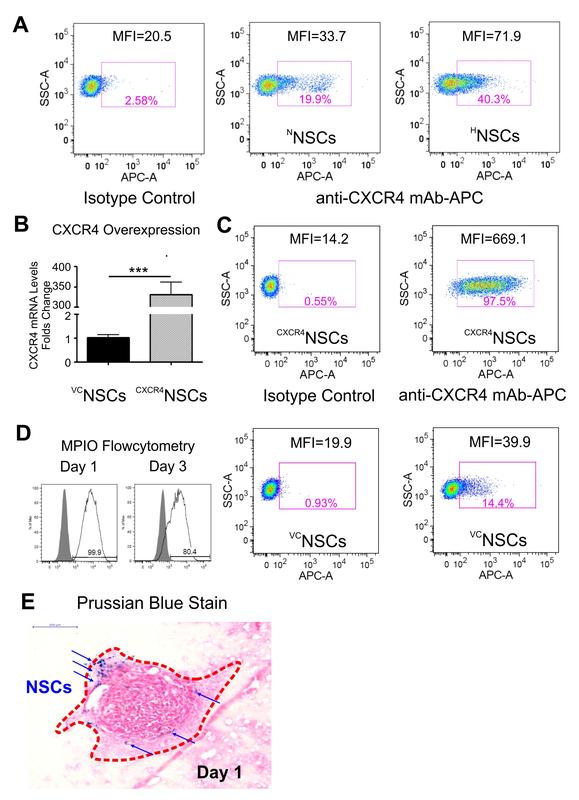 A tissue analysis indicates that head-only irradiation (Figure 2) induces reduction in tumor volume, as well as the SDF-1 upregulation in tumor and surrounding tissue (Figures 5A and 5B)4, which confirms the hypothesis that CXCR4 receptor upregulated expression in NSCs may facilitate tumor tropism after XRT. Survival analysis indicate that although irradiation (XRT) alone is beneficial for the survival of tumor-bearing animals (Figure 6A)4, additional benefits can be achieved using HNSCs loaded with OV over NNSCs loaded with OV in the context of XRT (Figure 6B)4. Significant survival benefits can be also seen with genetically engineered CXCR4NSCs in the same contextual therapeutic regimen (Figure 6C)4. Tissue analysis confirms that both HNSCs and CXCR4NSCs significantly enhanced the tumor-targeted delivery of OVs, as shown by staining for a viral hexon protein (Figures 7A and 7B)4. Figure 1: Schematic Flow Chart of the General Animal Procedures Involved. (A)Tumor models are created via xenograft of patient derived glioma cells. (B) Tumor growth is monitored via BLI. (C) Head-only irradiation therapy is delivered as described in Procedure 6. (D) Supine and head-tilt posture is maintained during the therapeutic intranasal stem cell delivery as detailed in Procedure 11. (E) Post therapy survival monitoring, small animal imaging and histological analysis of tissue if necessary are followed up. Please click here to view a larger version of this figure. Figure 2: The Setup of Animals for Irradiation. Anesthetized mice are positioned between lead shields inside the sample tray allowing for head only irradiation. Please click here to view a larger version of this figure. Figure 3: A Flow Chart for General Stem Cell Preparation Procedures Involved Prior to Intranasal Delivery. (A-C) Hypoxic pretreatment or genetic modifications of stem cells to overexpress CXCR4. 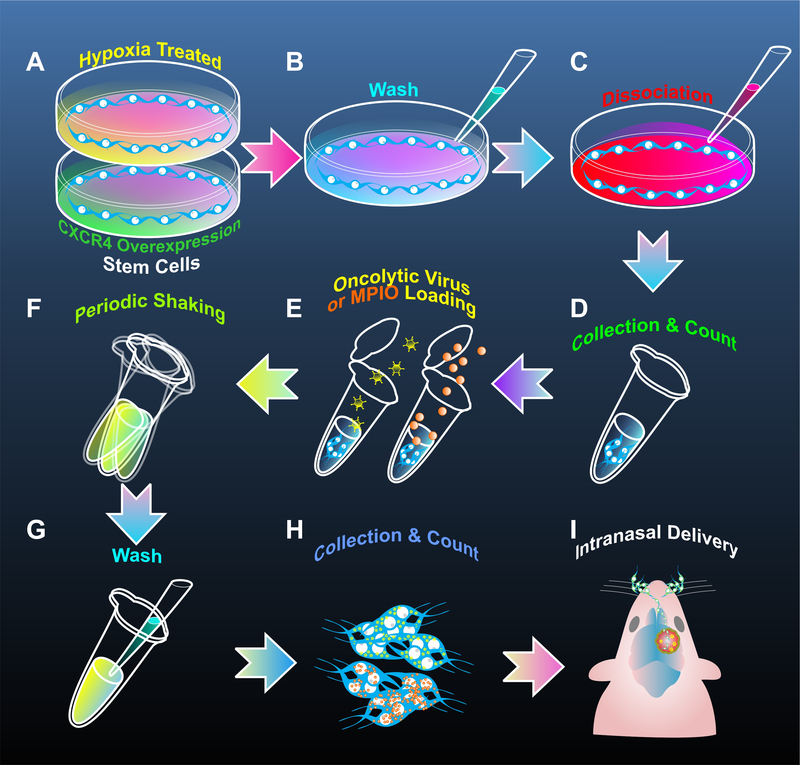 (B-D) Washing, enzymatic dissociation, cell collection, and counting steps are performed for subsequent loading of stem cells with therapeutic or diagnostic cargo. (E) Therapeutic reagents, such as oncolytic viruses, or diagnostic tracers, such as MPIO particles, can be loaded in collected stem cells in appropriate concentrations with periodic shaking and gentle agitation (F). (G-I) The loaded stem cells can then be washed and counted for intranasal delivery into mice. Please click here to view a larger version of this figure. Figure 4: Analysis of Stem Cell Modifications for CXCR4 Expression and MPIO Loading. (A-C) Flow cytometry can be run to verify the phenotypic modifications of stem cells as a result of hypoxic pre-treatment or genetic engineering. (Details can be found in Dey et al.4) (D-E) The detection of successful MPIO loading of stem cells and in vivo outcomes can be achieved via flow cytometry and Prussian blue staining, respectively. Please click here to view a larger version of this figure. Figure 5: The Hypothesis that Irradiation Facilitates SDF-1 (Green Signals) Upregulation in Glioma and Surrounding Tissue is Confirmed via Histopathology and Immunocytochemistry of Tissue Sections. Irradiation increases SDF-1 expression in GBM43 xenograft. The analysis of H&E staining and immunocytochemistry of brain tissue sections from control and irradiated mice demonstrates reduced tumor burden but increased SDF-1 levels at the tumor sites after XRT treatment. (A) SDF-1 expression (green) is strongly localized at the tumor site (white boxes) after XRT. (B) Densitometry quantification of the viewing fields demonstrates a four-fold increase in SDF-1 expression in XRT treated animals in comparison to control animals (n = 3 experiments, ***p <0.001, Student's t-test). Details can be found in Dey et al.4 Please click here to view a larger version of this figure. Figure 6: Survival Benefits of Modified NSCs were Observed (Details can be Found in Dey et al.4). (A) The context of therapeutic benefits of XRT was established (***p <0.001, log rank test). (B) Hypoxic pre-treatment of stem cells loaded with OV enhances animal survival (*p <0.05). C. CXCR4 genetic enhancement further improves survival of animals (**p = 0.0013). Details can be found in Dey et al.4 Please click here to view a larger version of this figure. 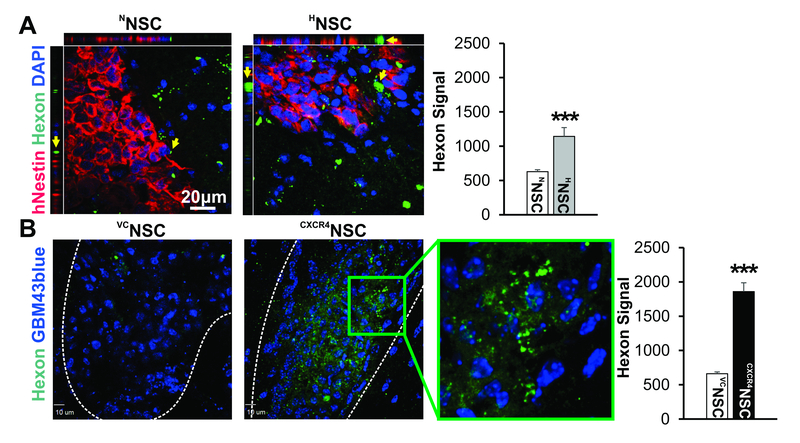 Figure 7: Confirmation of OV Delivery by Hypoxia- or CXCR4-enhanced NCSs to Brain Tumor Xenografts is Achieved via Viral Hexon Protein Detection by Immunocytochemistry (Green Dots) of Tissue Sections from Brains of Mice Treated with Either HNSCs (A) or CXCR4NSCs (B), ***p <0.001 t test. Details can be found in Dey et al.4 Please click here to view a larger version of this figure. Although the intranasal route of drug delivery has been widely explored for small molecules, nanomedicines, and protein compounds alike18, the application of therapeutic stem cells for intranasal brain tumor targeting is very new in the spectrum of brain tumor therapeutics under development2,3,4. There are intrinsic complexities involved regarding the behaviors of stem cells in the nasal cavity, and molecular details still remain unclear. The size of stem cells and their distribution mechanisms along cranial nerves differ dramatically from those of non-cell biologics or small molecules, and we are currently engaged in detailed mechanistic investigations involving the behaviors of therapeutic stem cells in the nasal epithelia. Molecular interactions involving stem cell surface cytokine receptor expression profiles, as well as extracellular matrix (ECM) adhesion molecules such as integrin, are under investigation to shed light on the underpinnings of the intranasal brain entry of stem cells. The critical steps within the current protocol are multifold: 1) Proper establishment of the intracranial glioma xenograft, as variations in tumor location and growth patterns might affect the chemotaxis that NSCs rely on for migration toward tumor; 2) Proper preparation of the NSCs and their health status and phenotypes that impact the chemotaxic migratory behaviors; 3) Adequate preparation of the nasal cavity with hyaluronidase, which has been demonstrated to improve stem cells migration from nasal cavity into the brain17; and 4) Correct supine posture of mice during intranasal stem cell delivery to prevent cell loss outside of the nostrils, and post-NSC delivery care of the animals. MRI2 or radiotracer-based imaging techniques13 in live animals could be applied for the real-time assessment of in vivo stem cell migration after intranasal delivery. For a preclinical study using animal models, there are limitations to predict the therapeutic outcome in the translation to clinical human patient studies. There are significant differences in the cranial nerve ending distribution patterns between rodents and humans19,20; thus, strategies to direct therapeutic stem cells to distribute along nerve ending networks more relevant to human brain entry through the intranasal route should be the focus for future research. These details are keys to successful clinical translation efforts, and the principles described herein are essential to establish the basis for further diversification of research parameters designed to distinguish molecular cues and the functional and anatomical differences between mouse models and human application specifics. In this pilot demonstration of the basic principles of using mouse PDX models of human glioma, we show the potential for diversified strategies to enhance the tumor tropism of hNSCs via hypoxic preconditioning and genetic enhancement in chemotropism promoting CXCR4 receptor expression to target tumor-associated cytokines. The significance of this comprehensive description of intranasal therapeutic stem cell delivery technique is evident, as it is the first step-by-step protocol describing an alternative therapeutic stem cell delivery strategy to the central nervous system (CNS) without invasive approaches typically required for CNS disorders. We aim to bring a robust experimental therapeutic platform to the forefront of developmental medicine for malignant brain tumors, such that greater mechanistic details can emerge from broad research explorations in the scientific community. Future expanded applications to treat CNS disorders of broad complexity and mechanistic diversity can be explored by researchers in the respective fields. This work was supported by NIH R01NS087990 (MSL, IVB). Shah, K. Stem cell-based therapies for tumors in the brain: are we there yet? Neuro Oncol. 18, (8), 1066-1078 (2016). Balyasnikova, I. V., et al. Intranasal delivery of mesenchymal stem cells significantly extends survival of irradiated mice with experimental brain tumors. Mol Ther. 22, (1), 140-148 (2014). Reitz, M., et al. Intranasal delivery of neural stem/progenitor cells: a noninvasive passage to target intracerebral glioma. Stem Cells Transl Med. 1, (12), 866-873 (2012). Dey, M., et al. 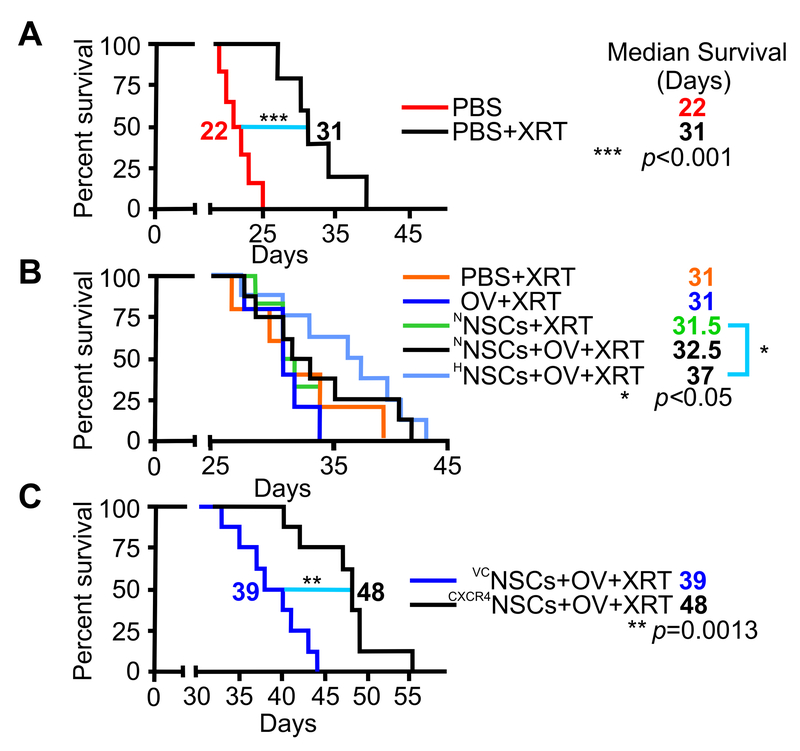 Intranasal Oncolytic Virotherapy with CXCR4-Enhanced Stem Cells Extends Survival in Mouse Model of Glioma. Stem Cell Reports. 7, (3), 471-482 (2016). Ahmed, A. U., et al. A preclinical evaluation of neural stem cell-based cell carrier for targeted antiglioma oncolytic virotherapy. J Natl Cancer Inst. 105, (13), 968-977 (2013). Kim, S. K., et al. Human neural stem cells target experimental intracranial medulloblastoma and deliver a therapeutic gene leading to tumor regression. Clin Cancer Res. 12, (18), 5550-5556 (2006). Lee, D. H., et al. Targeting rat brainstem glioma using human neural stem cells and human mesenchymal stem cells. Clin Cancer Res. 15, (15), 4925-4934 (2009). Lesniak, M. S. Targeted therapy for malignant glioma: neural stem cells. Expert Rev Neurother. 6, (1), 1-3 (2006). Robinson, K. GLPs and the Importance of Standard Operating Procedures. BioPharm International. 16, (8), (2003). World Health Organization on behalf of the Special Programme for Research and Training in Tropical Diseases. Handbook: Good Laboratory Practice (GLP). (2009). NIH. Number: NOT-OD-16-011. Implementing Rigor and Transparency) in NIH & AHRQ Research Grant Applications. (2015). Wakimoto, H., et al. Maintenance of primary tumor phenotype and genotype in glioblastoma stem cells. Neuro Oncol. 14, (2), 132-144 (2012). Cheng, S. H., et al. Dynamic In Vivo SPECT Imaging of Neural Stem Cells Functionalized with Radiolabeled Nanoparticles for Tracking of Glioblastoma. J Nucl Med. 57, (2), 279-284 (2016). Pritchett-Corning, K. R., Luo, Y., Mulder, G. B., White, W. J. Principles of rodent surgery for the new surgeon. J Vis Exp. (47), (2011). Clark, A. J., Fakurnejad, S., Ma, Q., Hashizume, R. Bioluminescence Imaging of an Immunocompetent Animal Model for Glioblastoma. J Vis Exp. (107), (2016). Ulasov, I. V., et al. Survivin-driven and fiber-modified oncolytic adenovirus exhibits potent antitumor activity in established intracranial glioma. Hum Gene Ther. 18, (7), 589-602 (2007). Danielyan, L., et al. Intranasal delivery of cells to the brain. Eur J Cell Biol. 88, (6), 315-324 (2009). Dhuria, S. V., Hanson, L. R., Frey, W. H. Intranasal delivery to the central nervous system: mechanisms and experimental considerations. J Pharm Sci. 99, (4), 1654-1673 (2010). Gross, E. A., Swenberg, J. A., Fields, S., Popp, J. A. Comparative morphometry of the nasal cavity in rats and mice. J Anat. 135, (Pt 1), 83-88 (1982). Marieb, E. N., Hoehn, K. Human Anatomy & Physiology. Pearson. (2007).